This spa / hot tub is in good shape except for the skirting. The doors have broken off, some of the slats have fallen in and the entire wood surface needs to be sanded and refinished. The missing skirting pieces were filled with scavenged wood from the old doors. New doors were built from an exterior grade siding and new hinges were installed. 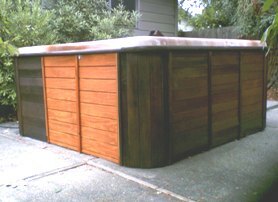 I would like to replace the wood on our Spa that is 10 years old. The wood is rotting and the doors have fallen off. Some of the interior wood might also need replacing. 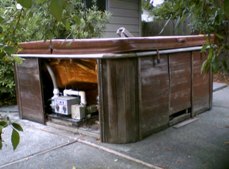 Hot Tub skirting has to be replaced – there may be a skirting kit that may work to replace the older skirt with new panels. It has been a redwood cabinet skirt that has rotten. The spa works fine but will replace the cover that is 93″ by 93″. The Hot Tub is wedged into built overhang that takes half of the tub that is covered. Maybe just the outer section can be replaced if possible. Will forward photos if interested. Very much like the one posted on this upper page.